And with today’s page (an epilogue of sorts), that’s issue one complete! Thank you SO much to everyone who has read, enjoyed and spread the word about Skull. I’ve seen a lot of reviews, a lot of podcast mentions and a lot of general recommendations about it bouncing around the internets, and i’m really appreciative of all of it. Especially since when it first started, there wasn’t that much to go on, but still people were digging it. Me, I was real keen to get the story moving along, much as I wanted to spend time building some characters at the beginning, I was getting kind of itchy to get into some hard Skull action. 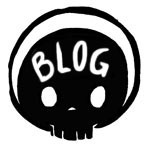 So now we have our Skull, we have ourselves a comic. 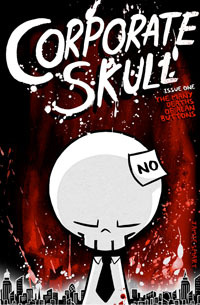 You can read Corporate Skull from the start by clicking links above the comic, or the cover here. If you want to comment or share Corporate Skull around, please do. Word of mouth keeps these things afloat, and if you can think of any way to help spread the word I’d love to hear it. 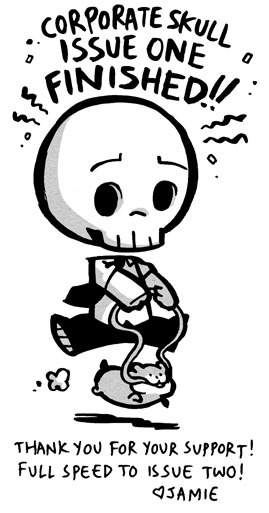 Anything anyone can do to get Skull to more people is, needless to say, VERY appreciated. If you do interviews/reviews of Skull let me know! Or if you wanna just chat about what you think’s going on, i’ll try and reply to comments more often! And oh yeah, issue two. Lets meet back here on friday and talk about when.